Cheap beach vacations in Maine for the fun AND frugal family can easily be yours! After all, to vacation richly doesn't mean that you have to spend foolishly. When you make a game of seeing how great a time you can have on cheap family beach vacations without spending big bucks, you return home with so much more than sand in your bathing suits and great memories -- there's that sense of personal satisfaction as well. And that makes for some of the best family beach vacations of all, doesn't it? Maine is probably the least expensive of the New England states in which to entertain yourself, at least in terms of cheap summer vacation destinations. For instance, if you compare seeing the same show in Boston vs. Portland Maine, and include parking and dinner, it's almost laughably cheaper in Portland (and infinitely less hassle getting in and out of the city). The dining scene in Portland is unbelievably good, too. 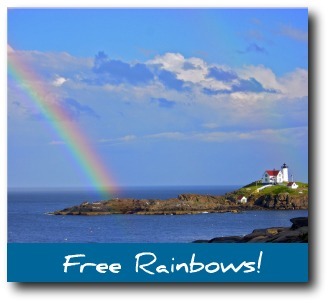 As for York Beach Maine and the surrounding coastal Maine towns, you can't beat this region for summer vacation deals! We already provide the ideal setting for cheap beach vacations at the perfect price -- FREE. We've got a free ocean (comes complete with free waves to ride, free sand to build sandcastles out of, and free rocks to climb). The town of York owns a world-famous lighthouse, and guess how much we paid for it? One dollar! But we'll let you come and picnic there for FREE. Entertain the kids at the huge beachfront playground at Short Sands? Free. Parking at York's beaches? Dollar an hour. Parking to see a show at America's favorite summer stock theater in next-door Ogunquit Maine? Free. Lobster? Not free, but cheap, 'cause if there's one thing we've got plenty of in Maine, it's lobsters! Box seats at a kid-friendly Boston Red Sox minor league ballgame at Hadlock Field in Portland? Under ten dollars. Come along with me on the seashore thrift tour -- I have loads of great cheap summer vacation ideas to share with you! Well, you can't sleep on the beach here without getting disturbingly wet at high tide, but you do have to sleep somewhere. In addition to camping and a vacation rental in Maine, consider York Maine Hotels & Motels, particularly in the off-season (basically anything except July and August). Some of the more budget-friendly choices are listed in the fifth paragraph up from the bottom of the page. Want to read reviews of York Maine hotels from those who know? Find Hotels That Travelers Trust. Over 40 Million Unbiased Reviews! Remember, September is still summer! This month, along with October, brings wonderful beach days when the ocean is at its' warmest, and lodging prices drop. The only thing I like better than eating out regularly is paying as little as possible for it! Other ideas for local dining for less? How about picnics? You still don't have to cook, but you don't have to pay a lot, either. Free ambience! There are a tremendous variety of great restaurants in York, and many of them provide take-out seafood, sandwiches, sides and more. Take your picnic basket to any of our fine Maine sand beaches, or to Harmon Park across from the York Harbor Inn on Coastal Route 1A, the top of Mount Agamenticus, or to Fort McClary in nearby Kittery Point Maine. The Beaches -- always free, always beautiful! Visit southern Maine water parks & amusement parks on discount days or after 3 p.m. Enjoy a trolley ride in York or Ogunquit -- wicked cheap! Visit the Portland Maine Museum of Art on Friday nights from 5 to 9 p.m. - free! Looking for even more destinations for kid friendly beach vacations? Try these First Hand Family Travel Reviews of Kid Friendly Beach Vacations - favorite beaches, kid friendly restaurants, and fun things to do at the beach with your family!